The DigiTech Obscura Altered Delay features Analog, Tape, Lo-Fi and Reverse modes, to re-create the distinctive sonic signatures of early tape-based echo and delay units and all their aural idiosyncrasies. The Degrade and Tone knobs enable players to control the amount of increasing signal degradation and high-frequency rolloff of successive repeats, and the reverse mode emulates the dizzying psychedelic sound of playing a recording backwards. The Level control adjusts the amount of dry to delayed signal, while the Time knob dials in the duration of the delay from slapback to 2 seconds of delay. The Repeat control adjusts the number of delay repeats, from a single clean repeat to chaotic oscillating runaway. The Obscura Altered Delay’s Tap Tempo mode with beat divisions enables the player to tap the footswitch to match the delay to the tempo of the music. Adding to the sonic hijinks, the pedal’s Repeat/Hold function will lock onto and loop a phrase and its Tails on/off switch controls whether the delay continues after the effect is switched off, or cuts off abruptly. The Obscura Altered Delay features mono and stereo inputs and outputs, true bypass operation, die-cut hook and loop pad, redesigned Stomplock, and a rugged metal chassis. 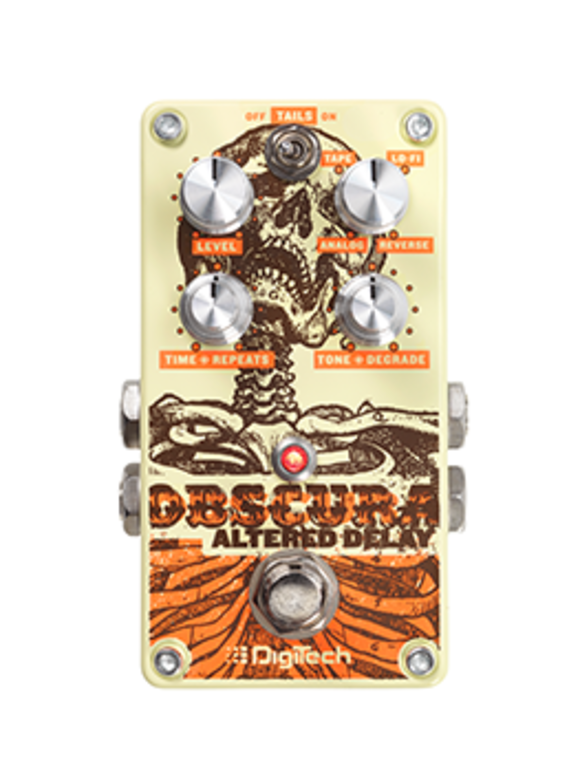 The DigiTech Obscura Altered Delay will be available in April 2015 at a suggested retail price of $187.44.